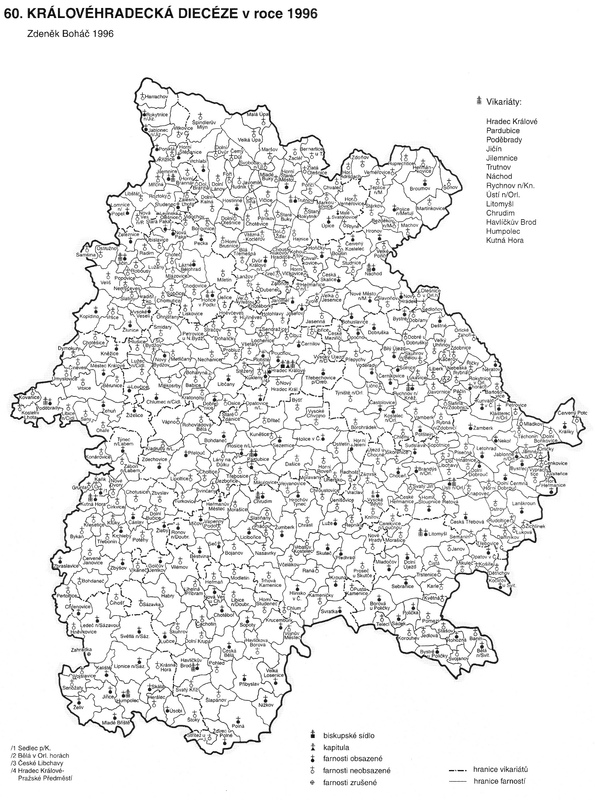 The Zámrsk archive covers the eastern part of Bohemia and part of the Vysocina Region. The website contains 11,000 volumes holding birth, marriage and death records for Roman Catholic, reformed churches, Czechoslovak Hussite Church, and state registers covering the time frame from 1587 through 1949. The years covered vary by parish. There are no Jewish registers held here. They are in the National Archives in Prague. This archive operates a bit differently than most of the other archive websites in that you must download pdf files rather than view the documents on the website. Although that means you must spend some time downloading the various books you wish to access, on the positive side, once you open those pdfs, you can move from page to page very rapidly and you can keep them on your computer for future use. included villages will be listed beneath. The bold type will indicate the name of the parish and information about the villages included. Next you will find listed, one at a time, each volume, that it contains (birth = N, marriage = O, and death = Z. ), the years covered (e.g. 1634-1745), the villages referenced within the volume (and usually the years covered for that village), and the number of pages (fol.). Most importantly, the link (highlighted in blue) is at the end of the paragraph and you can simply click on it and it will download. After 2016, almost all parish records have been posted. The law does not allow births of less than 100 years for marriages and deaths of less than 75 years to be posted. Even if a volume has records older than that timeframe, if it also includes newer records, it will not be posted until it meets the legal requirements. The download folder will be a zipped file. You will need to use software such as WinZip to “unpack” the file. When this is done, each page in the volume will be displayed as a separate jpg file. The Zámrsk archive will no longer conduct research for individuals. The only exception is if you know the exact date of the birth, marriage, or death and the exact location. Then you can complete the form found on the website and for a fee a copy of the record will be sent to you. If you visit the archive, you can search the records, but be aware that seating is limited and if all the cubicles are full, you will need to wait outside until the next cubical becomes available. You will want to check the website for more details if you plan to visit the archive in person. Cadastral Maps: Cadastral Maps are not available through the Zámrsk website. Click here for basic information about accessing cadastral maps. Seignorial Records: Seignorial records are not available through the Zámrsk website. Records are available at the Archive for onsite review. School Registers: School registers are not available through the Zámrsk website. Records are available at the Archive for onsite review. Many records from this archive can also be found in FamilySearch. Additional information about using the Zámrsk Archive can be found at FamilySearch Wiki.